I have been in Buenos Aires for three weeks now and so far my travel experience has been great. I arrived in Argentina in September and had a week of relax before my travel adventure, or should I say working holiday, would begin. At my university I had arranged for me to work at an elementary school in Buenos Aires instead of doing some boring internship back home. I really wanted to use my knowledge and put everything I had learned over the past couple of years during my pedagogy classes in practise. The teacher at the school in Buenos Aires was really friendly and we got along right away. She also introduced me to a girl from France which is now working together with me and has become my travel hubby. That first week before starting at the school was perfect to blend in and find out what Buenos Aires is all about. 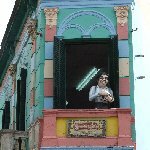 I went on a bit of a walking tour and visited the La Boca neighbourhood which was really cool and kind of overwhelmed me. 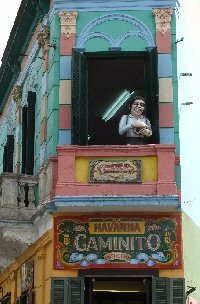 The colours of the buildings are amazing and everywhere you look there are puppets hanging out of windows, couples engaged in passionate tango dances and waiters trying to talk you into sitting down at their restaurant. 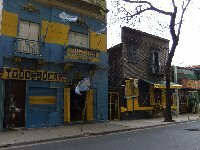 I had heard about La Boca not being the safest neighbourhood in Buenos Aires so I tucked my camera down my jeans and left my bag at home. The photo's might not be as many as I hoped but the ones I took are really great I think! 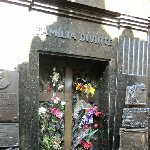 Then of course I had to visit the grave of Evita Duarte de Peron, Argentina's most powerful woman all times and practically a landmark for the city of Buenos Aires. The Recoleta Cemetary today is visited by both travellers and locals who come here to pay their respects and bring flowers. 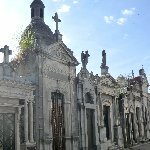 The Duarte Family mausoleum is always decorated with a lot of colourful flowers and is probably the most visited in Argentina. These are just two attractions but believe me Buenos Aires is full of eyecathers and a week of relaxation and sightseeing flew by! My job at the school will last another week and then I have to decided whether I want to fly back home or continue my travel plans and maybe explore a different part of Argentina since my classes will start again at the end of November. A difficult decision but hey let's take it easy como en Argentina! 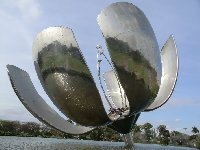 Did you enjoy Travel Buenos Aires and have you been on a holiday in Buenos Aires, Argentina? 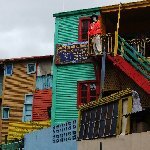 What to do in Buenos Aires: Visit the La Boca District but be careful not to show your camera on every angle..